I’m a huge fan of the Warhammer 40K lore, despite never actually having played the tabletop. I was always more for watching than participating, as I found it was easier to enjoy the fruits of others’ labour than to expend my own effort and money. It’s a similar feeling that I have for EVE Online, in that I’d rather hear or see the events unfold, rather than spend countless hours flying around achieving nothing at all while waiting for the brief moments of excitement to arrive. All the power to those who enjoy these things, I just know it’s not for me. How is this relevant to Space Hulk: Deathwing, you ask? Well, in the 40K universe, the Terminator squads are about as badass as they come, and the Space Hulk is about the most consistently action-packed setting there is when it comes to Tryranid-trashing action, so it seems like this would be the perfect game for someone like me—someone who wants to skip everything and get right to mangling Genestealers. I’ve been excited for Space Hulk: Deathwing for a while now. Space Hulk made for a great board game, but it didn’t translate well to PC, so a real-time L4D-style game in the 40K universe should have been an instant success—and yet, I feel strangely ambivalent about the whole experience. I WANT to like it, but there are just too many things that are spoiling the game for me. Allow me to elaborate. 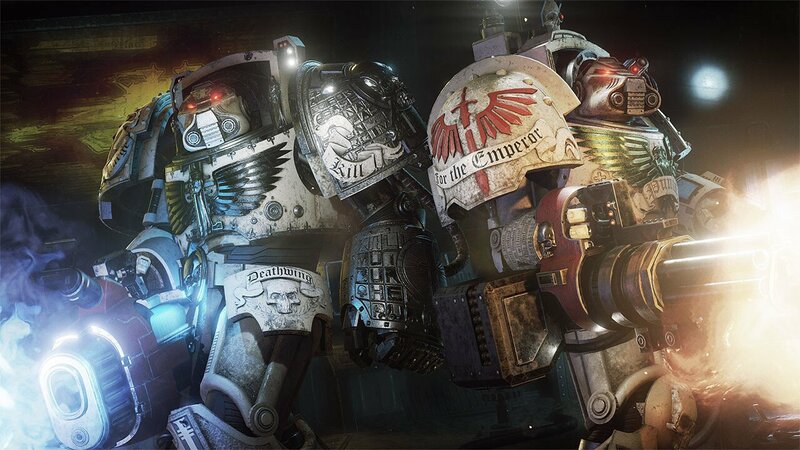 At its core, Space Hulk: Deathwing is a L4D-like that pits you and three other members of a Terminator squad against endless numbers of Tyranid aboard the Space Hulk, a mangled amalgam of destroyed capital ships. It’s a simple enough formula consisting of shooting and completing objectives—usually by shooting. And yet, for all this shooting, it feels a strangely unsatisfying experience. There’s very little feedback in the game, both outgoing and incoming. Shots don’t feel like they have weight (a near-unforgivable sin, given the bulk and power of the weapons the Terminators wield). Sound effects aren’t convincing, enemies don’t respond as you would expect, etc. Likewise, there’s very little “feel” to the incoming damage as well, particularly if you’re being attacked from behind. I understand that I’m essentially entombed in a giant metal exoskeleton, but I found myself having to stare at my armour indicator almost constantly in order to ascertain where I’m being hit from, as there’s so little visual feedback to indicate this. Likewise, because you’re playing from the perspective of “inside a metal box,” sound effects can be misleading. Oddly, this is one of the better bits of detail, as it at least makes sense to have a distorted sense of sound, but it also compounds the issue of feeling like a passive observer than an active participant. Similarly, for a 7’ tall metal-clad supersoldier, I don’t feel convincingly heavy. Visual and audio feedback while moving is, once again, underwhelming, while the player feels surprisingly agile, yet not in a good way. 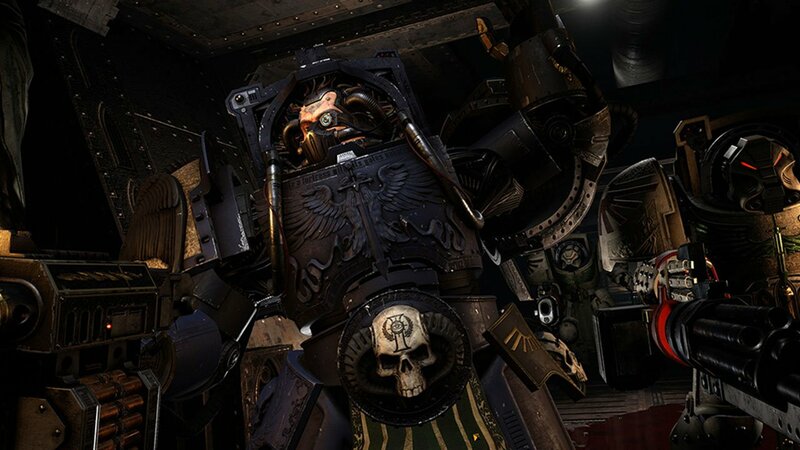 There’s a sense of methodical, creeping-doom traditionally associated with the Terminators, and Space Hulk: Deathwing misses the mark on all fronts. Sure, a lot of this is based on my expectations as a 40K nerd, but if I strip that away, I’d also have to strip away all the freebies that come with it, at which point it just feels like a mediocre squad shooter to play with friends that does everything it can to discourage you from actually enjoying it. Weapons are painfully inaccurate to balance the whole ranged vs melee equation, lobbies reject or drop players for no apparent reason, communicating with squad members is hopeless, and all progress and unlocks are wiped after every game, so even if you DO find a decent squad, it’s usually late-match before you’ve unlocked your preferred equipment loadouts, only to lose them all over again and start over. Paired with the very limited map/ mission pool, there really isn’t much to enjoy about Space Hulk: Deathwing. This, to me, is a real tragedy. This should have been the 40K game that we were all waiting for. 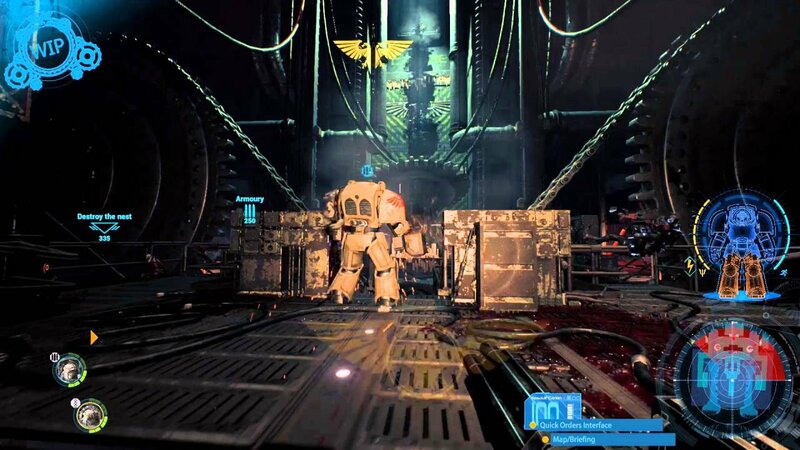 The corridors and antechambers of the Space Hulk are stunning. It does an excellent job of selling the environment of warships as a place of worship; with all the temples and grandiose scale and architecture a fanatical faction would need when away from its God-Emperor. All the more disappointing, then, that it’s let down by a general prevailing feeling of underwhelming-ness and design oversights. It doesn’t feel at all rushed, either; it just feels like it was met with technical limitations and poor design. Not something the Imperium of Man is known for being bogged down by. I want to like Space Hulk: Deathwing—truly I do—but thanks to its poor delivery, and high price tag of $50CAD, this is one game that I don’t see having its gene-seed harvested to produce a sequel.